Morning class, this week I’ve been in Mallorca soaking up the scenery and enjoying painting outside. 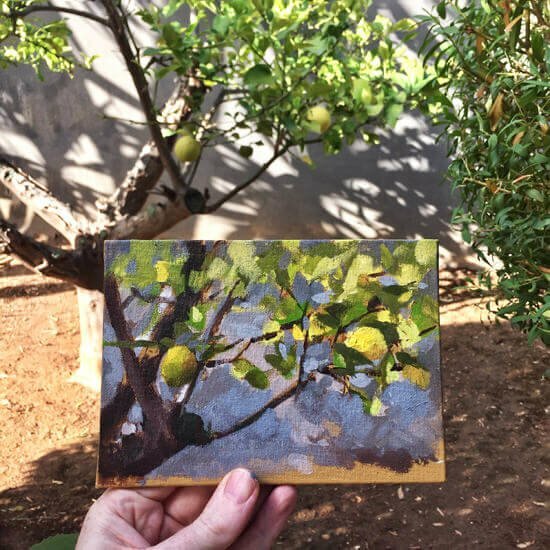 I found this secluded tree within a lemon grove that I thought would work well as a little Plein air sketch with acrylics. You can download a reference image below to follow along with the lesson. You can download a larger version of the image here. 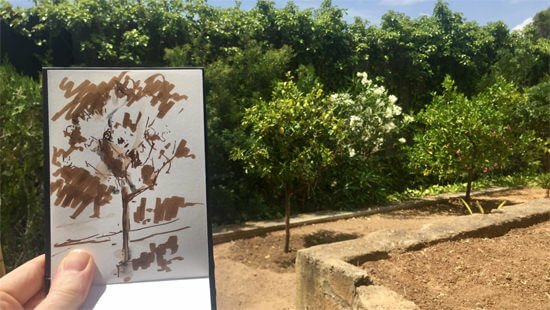 With my first sketch, I wanted to incorporate the whole of the lemon tree but the sketch brought up a number of issues within the scene. 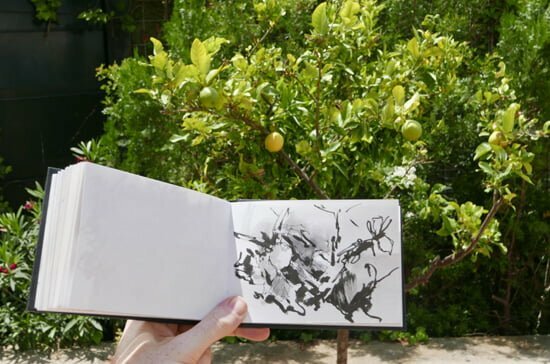 There wasn’t nearly enough tonal contrast or space around the tree and the lemons weren’t prominent enough in the sketch as they had initially appeared, so I moved position, searching for an alternative close up view. A closer view of the same tree but the mass of leaves meant there wasn’t enough separation between the background and main subject for the style of painting I was going for. I wanted a more contemporary composition. 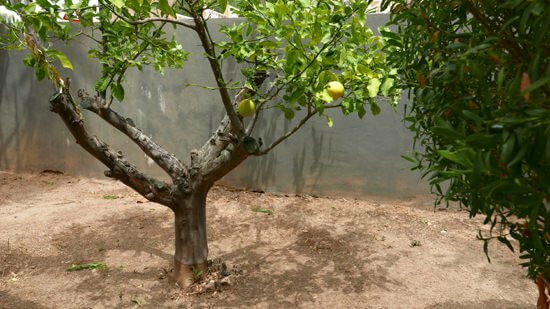 I finally settled on this lemon tree as it had some lovely negative spaces in-between the branches and a great muted grey wall behind, that added a nice colour balance to all the ranges of greens in the tree. 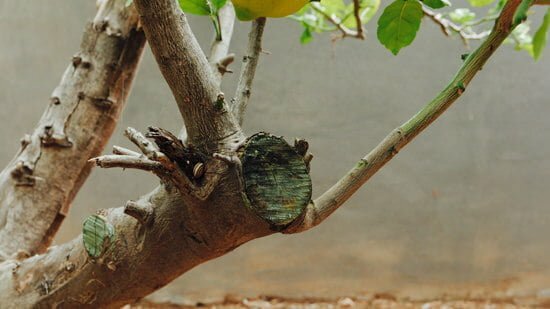 Here’s a close up of the trunk, notice the lovely green hues on the edge of the branch and the warm stone colour on the bottom right of the wall. This helps to give a good indication of the colour ground that would work well for the study. The canvas board I used (7 x 5 inch) had been pre-prepared with a colour ground of Yellow Ochre Acrylic paint. For the sketch, I used a Burnt Umber watercolour marker, as it’s water-soluble it allows me to blend sections using just a water brush pen to softly indicate the shadows. Here I’m setting up a plastic craft box that can be used with acrylic paints when working in a hotter climate. I’ve cut small sections of a stay-wet palette to fit into the slots on the top row, and this will keep the mixes wetter for longer. I soak the absorbent paper underneath with water, then lay a greaseproof paper on top, which the paints sit upon. I’m sat in the shade with the box on my knee, drawn out and ready to start painting. I’ve also cut a grey tear-off palette to size and taped it onto a piece of card so it fits snugly on the bottom shelf of the box. 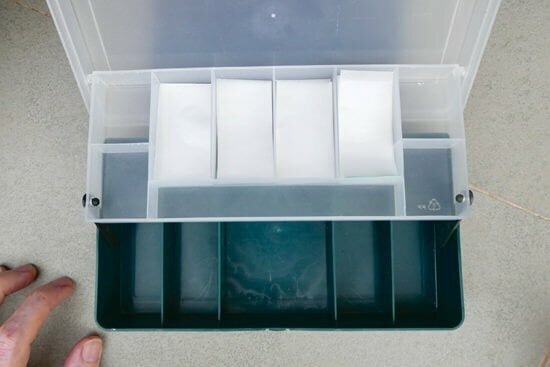 This acts as a sturdy mixing palette when sketching but can store neatly within the box when travelling. I use two whites, a student grade Galeria White from Winsor & Newton and an artist-grade Titanium White from Golden Paints. I predominantly used the Winsor and Newton white for this study as the consistency from the tube is a little more fluid. The first colour I mix is a muted grey tone, using Burnt Umber and Ultramarine Blue. I’m not using any water to dilute the paint but dipping the brush into the acrylic glazing liquid. 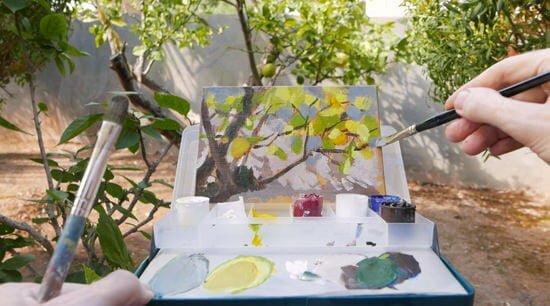 I use a small size 4 Round brush from Rosemary & Co and concentrate on the shadow shape being cast by the leaves and branches of the lemon tree. I then paint in this pattern around the drawing of the dark tree trunk on the bottom left. Once I’ve got some of the darker greys in I start to add a lighter, slighter warmer grey to increase the tonal range and interest within the background. I’m still only looking for the spaces between and around the tree. I swapped to a larger size 6 filbert brush. This is from Isabey called an Isacryl brush. Using a dark mix of the Burnt Umber and Ultramarine Blue I block in the tree trunk. Adding a little light gives a variation to indicate the direction of the light fall. Using a small flat synthetic brush I begin to block in a base using Azo Yellow Medium. 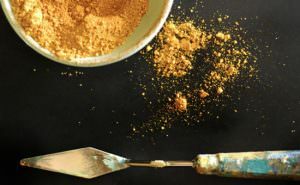 This colour isn’t as opaque a Cadmium Yellow but is a non-toxic version. 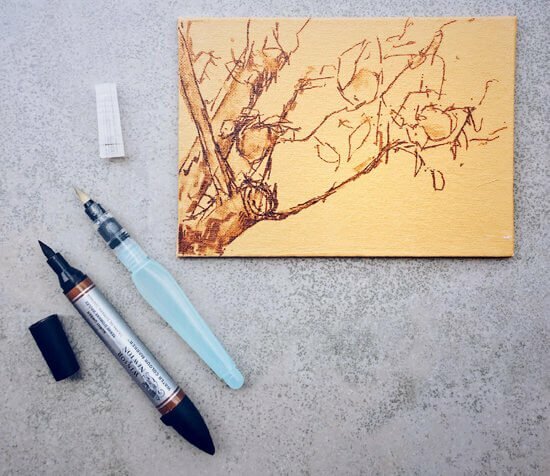 You might notice some areas where the watercolour marker blends into the wet paint, giving a muted orange hue to the undertone. I take a tiny touch of the Phthalo Green (blue shade) and mix with the yellow to get this vivid sap green. I then start to apply this colour to the top section of the painting and begin to vary the intensity and variety by altering the colour using yellow and white. Adding white will cool the yellow but allow us a greater tonal range. Now the block-in has dried, I start to judge my tones again. At this stage, the light has also changed so there isn’t as much of the patterned contrast on the wall, but I’m trying to keep that colour effect in my mind’s eye until the cloud cover passes. Just using the fine edge of the square brush I indicate the pattern of the branches. I now mix a cooler blue to balance with the sap green for the top section of the painting. Now the sun has briefly come back into the scene, I try to get down the shadow pattern on the wall. 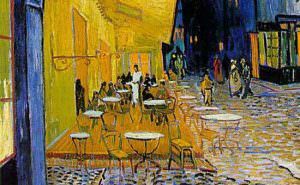 By painting in some darker green around the foliage at the top of the painting and then breaking that up with some of the muted blue colours, there are fewer colours to fight with the lemon. As I continue to simplify the background I also accentuate the lemon by adding some thicker impasto onto the sides in the light. 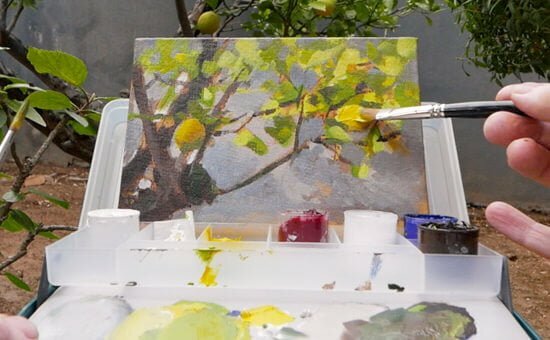 This impasto area is only on the lemons so it makes them stand out more from the background. Here is the finished Plein air acrylic sketch, the total painting time was about 30 minutes with a 15-minute sketch. This is Tom, a little friend who joined me by the trees. My pleasure Dianne, hope your lemon study turns out well. Oh, I love this. Thanks for the tutorial. I love lemons. They remind me of Sorrento. Gotta try this little painting in oils. Thanks again. Love getting your emails. Good one Piper, really pleased you enjoyed it. This is exactly what I have been looking for and today it pops up in my email!!. Did you transfer your tube paints into these mallet containers!? Hi Jelly, yes, that’s right, just top them up from larger tube paints. You are a really good artist and a great inspiration with your fine studies and it is just wonderfull to have the details of your chosen materials written Down. It is very inspiring. Really pleased you found the materials helpful Lis, hope it helps with your plein air sketches! Really hope you enjoy it Dawn. Good timing Andy, really hope you enjoy it. Great demo Will! 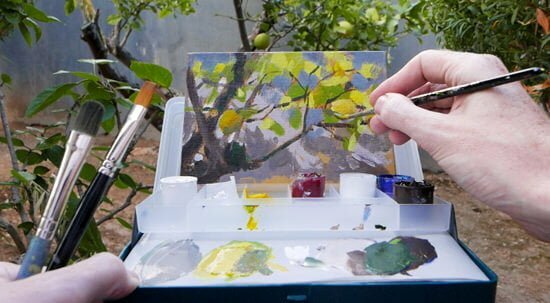 Really wish you would do more of these plein air demo’s for us. We learn so much more by watching, rather than reading. 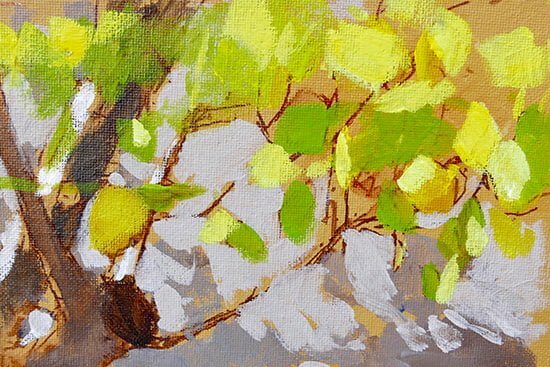 I really picked up a great tip about bringing the lemons out with the darker color around and the impasto. The shadow behind really makes this little painting so much more interesting to the viewer! Thanks Sherrie, really pleased you found it informative for your learning style. Thank you Will for a delightful tutorial. 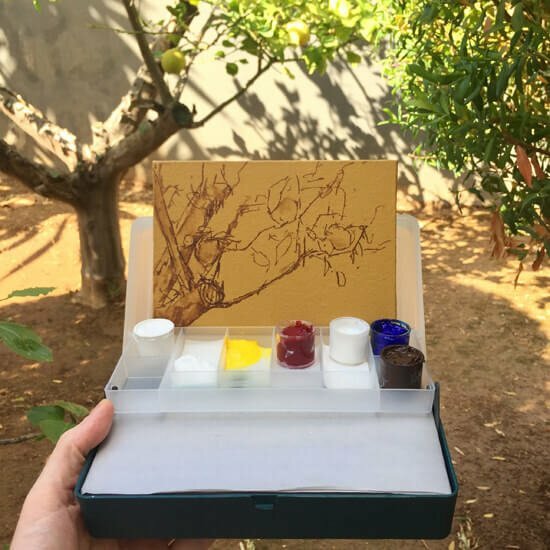 I am impressed with the ingenious set-up of your palette in the box for acrylic paints with a support for your prepared board. That looks ideal for plein air painting. I shall certainly try it sometime. The lemon grove is such a lovely subject. 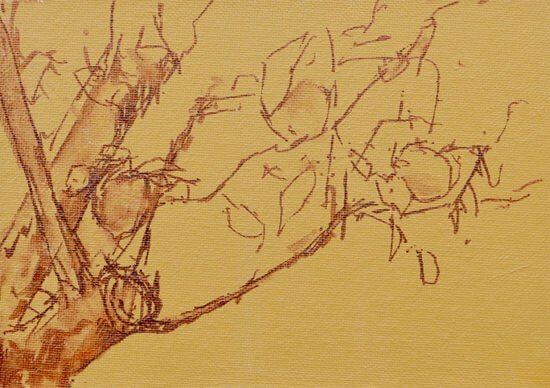 I like the way you paint tonally and build up the tree and lemon shapes and form. My pleasure Maureen, hope you enjoy painting the lemons. Thanks dear for sharing the video. Glad you enjoyed it Ubaid. Muchas gracias Abel, espero que disfruten pintando la escena. Thanks very much Abel, hope you enjoy painting the scene. Will, I really enjoyed this one and I think I will have to have a go at it, thanks so much for sharing, I learn so much from you. Many thanks, Frances. Thanks very much Frances, really pleased you enjoyed it. Well, I thoroughly enjoyed watching that extremely succinct, informative and attractive video resulting in that lovely painting. But I am puzzled as to how the brushes in your left hand kept so clean? I always keep the bristles of mine in water when temporarily not in use ; then wipe before using again. Is this yet another thing I have been doing wrong? Hi Jill, there was a couple of times during the painting that I cleaned out the brushes in water. Thank you for this Will! Looking forward to giving it a go. Hope it goes well Helle. Pleased you found it easy to follow Amal. Will, I continue to be very impressed by the generosity of your web site. 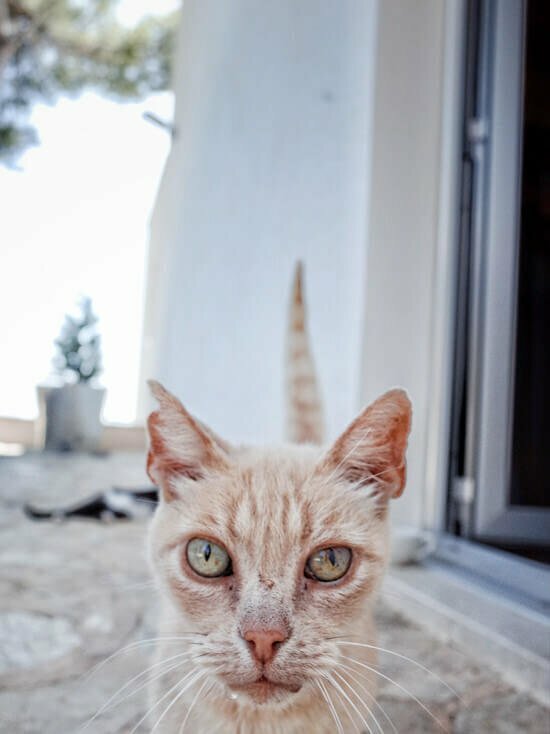 I realize that to some extent it is marketing to sell your paid content, but you do not have to do it, and I am amazed and grateful at the high quality of the stuff you offer for free. The paid tutorials are great as well. Cheers Doug, yes, lots of schools follow along with the free tutorials so want them to be useful for all students, really glad you’re enjoying the courses. Check out these year 10 jugs paintings! I really enjoyed the lemon tree tutorial. I always learn something! Thank you! Thanks Beth, hope your painting goes well. 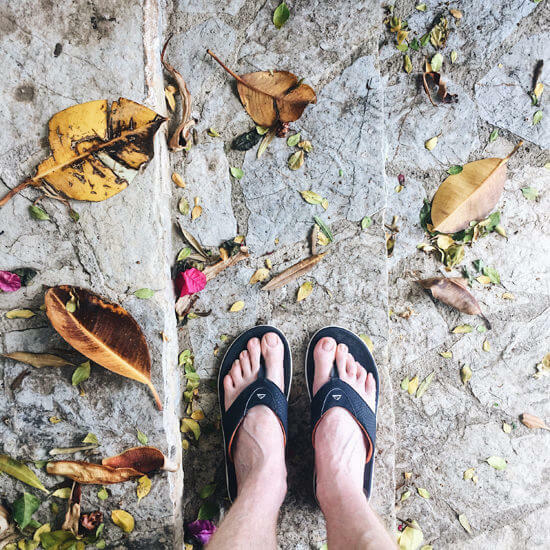 Thank you so much Will – love your easy to follow instructions and will give this a try. Kind regards, Cheryl. Cheers Cheryl, great stuff, pleased you found the steps easy to follow. As always – a pleasure to watch your development to the final painting. You are very generous with your talent and absolutely encouraging. My pleasure Yvonne, glad you enjoyed watching the painting develop. So much enjoyed that…followed your every stroke to “finish”…I liked the idea of using a watercolor under sketch, and liked the way you set up the negative space, and so many other facets of this demonstration. No lemon trees in Edmonds, WA but there is a plant outside called Jerusalem sticky sage which looks like vertical pom poms in yellow….I might try it using your pallette! This was a much-needed inspiration! Love the cat..I think he needs a snack. Thanks Delores, and so pleased you’ve been inspired to adapt the techniques to your own inspirations around you, hope the Jerusalem sticky sage goes well! The colours are very similar. Ha, ha, Vanessa loves Paris! really pleased you’ve been enjoying the Venice course, Liz. 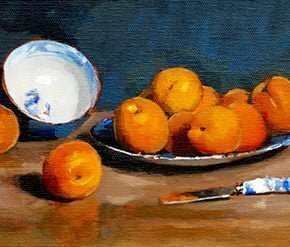 How lovely Ann, hope you can use the methods to capture them, clementine trees are fab to paint as well. Thank you for that. Nice little tutorial. 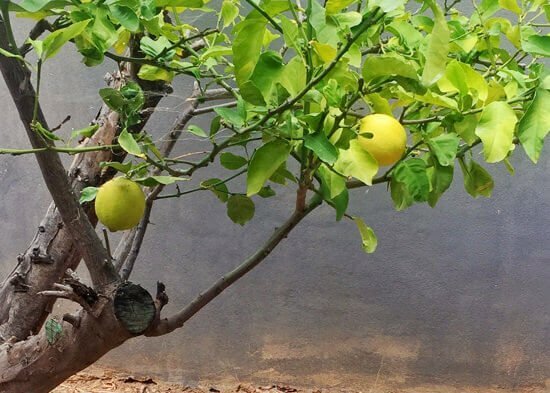 I so enjoyed the lemon tree painting. Made me realise how important building up the layers is. I could almost smell the lemons them by the end of the demo. Definitely want to give this one a go. Thankyou. Thanks Tricia, really pleased you felt transported to the lemon grove, good luck with your painting. Cheers Bob, yes a real privilege to paint there, hope you’re well. Ha, ha, you’ve got it Alastair, in was very Zen in brush movements! Thank you so much Will. Once again a little masterpiece. You’re very kind Patsy, pleased you enjoyed it. Τhank you Will for sharing this great video. I will try it God bless you. Hope it turns out well for you Sophia. Fabulous Will. I go to north of Majorca twice a year cycling, this year I took a sketchbook ! The smell of the oranges and lemons is glorious isn’t it, whereabouts on island were you ? Thanks Cath, we were near Calvia. Thank you Will for sharing a lovely tutorial once again. I have been hoping something would inspire me to pick up a paintbrush again, and this has done the trick. My pleasure Jenny, so pleased you enjoyed it and are feeling inspired with your paintings. Your canvas (?) are my incentive. How do you find working plein air with acrylics? Hi Rob, they can work great, especially for quick transportation of paintings. Wonderful landscape and lovely art work Will! Always fascinated by your videos and paintings. Thanks Namrata, glad you liked the lesson. Seriously though I really enjoyed the video and the step-out lesson. Not many people still do the step-out if they make a video and I just want to say thank you for your time and effort. I like to print the step-out and keep it in a binder for reference when I really like a painting lesson, so Thank you! You are always enjoyable to watch and listen to. Hi Maria, nice to hear from you, really pleased you found the steps and the video enjoyable, hope your paintings are going well. I really enjoy this lesson in plein air and how you showed the progression in finding the proper composition. Your painting lessons have made me a better artist. That’s brilliant to hear Joe, really pleased you’ve been seeing progress in your own paintings. Thanks Will for the lovely step-by-step. Very helpful and your results are always so inspiring! I’m going to try this for my next painting. Love the impasto on the lemons! Thanks Janie, hope your lemon painting goes well, yes those little impasto touches can really help to tweak the focus in your paintings. Hi, Will. Really appreciate your generosity in sharing your knowledge. Thank you. My pleasure Ed, hope you’re well. Thank you, Will! This was a lovely “Mini-Vacation” for me this evening! Next to painting myself, I love to watch another good artist creating! It was a delightful little painting and one I can really enjoy doing myself in a short time. Your commentary is so pleasant and helpful! Thank you again. I enjoyed watching this step by step paintining demo, I felt I lifted each brush and mixed the paint. Regards, Linda. Hi Linda, well that’s fantastic to hear, pleased you felt part of the lemon grove. Thanks, Will, for your tutorials. I have enjoined them so much and have been happy with the results. Great explanations! I was wondering do u paint nudes? and do u plan to do the tutorial how to paint human body with acrylics? another question, do u organise painting workshops? 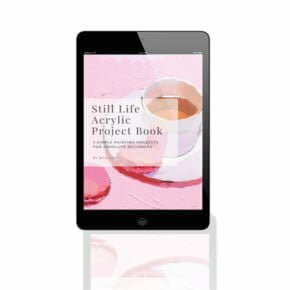 Hi Yulia, I don’t currently run any live classes, but you might be interested in the how to paint skin tones with acrylics course that looks into developing a realistic skin tone palette using acrylics. Thank you so much. Brilliant quality and utterly inspirational. I really appreciate the careful, methodical way you teach. So grateful! My pleasure Philippa, so glad you enjoyed the painting process. 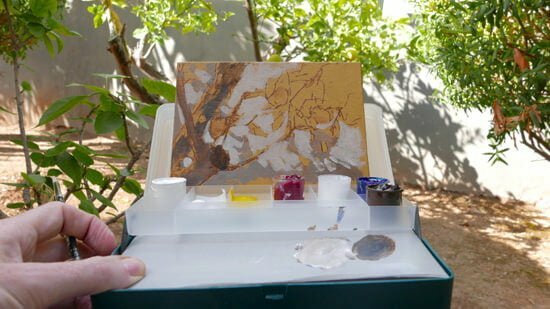 Hi Will, really great tutorial about Plein-air painting. Did you use the more transparent Azo yellow to avoid the Cadmiums or for technical reasons. And what do you think about the Bismuth Vanadate yellow to use as a substitute, which has more opacity than the Azos? Really enjoyed watching your new vid. Thanks for all the handy tips and detailed informations. Hi Stefan, pleased you enjoyed the tutorial. The main reason I used azo yellow for that painting was it was the only yellow I happened to travel with on the trip. Bismuth Vanadate Yellow would also work well. Fantastic painting, as always…Thank you for sharing. And I have a suggestion for your next vacation: Madeira Island. 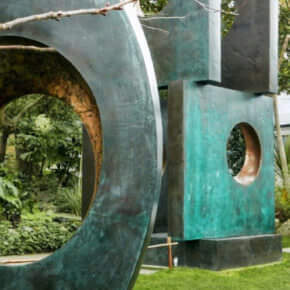 You will be fascinated with the different greens of luxuriant foliages, the blues of sky and sea and the browns of the grounds. Cheers Marta, sounds like some fantastic colours and scenery, really pleased you enjoyed the lesson. 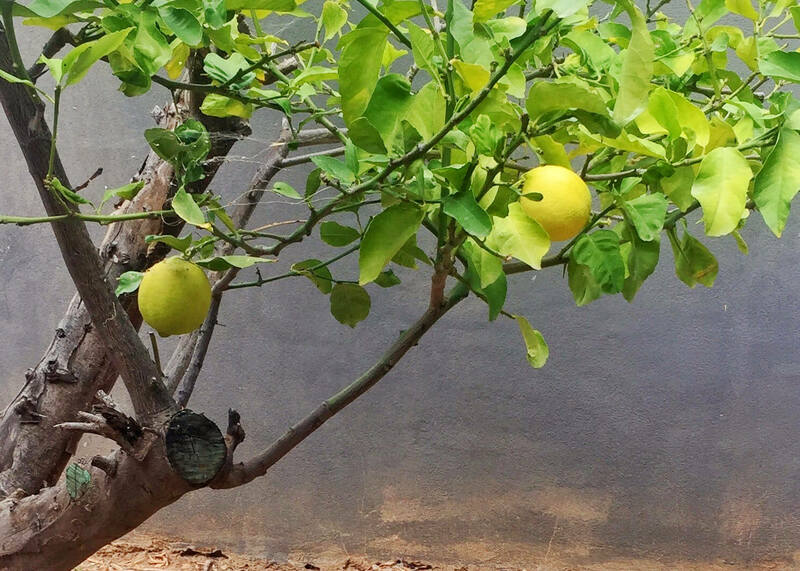 I have a lemon tree in my garden. Unfortunately possums have eaten the lemons. I will use this tutorial when i get some more on the tree..
Good one Vivienne, hope you find it helpful when you’ve got some fresh supplies! Thanks a lot Will. As always….WONDERFUL! Thanks very much Tamara, pleased you enjoyed it. Thanks so much for this great demo. I especially liked the rejected possible painting subject sketches and the reason you felt they wouldn’t do. These preliminary sketches are so important and yet we often fail to do them and then end up with a painting that doesn’t match our original enthusiasm. Your showing the sketches and why they were not going to work in a painting really drove the point home in such a great way! Thank you!!! And thank you for your generous videos and instruction. I so appreciate them! My pleasure Elizabeth, really pleased you found the steps of what didn’t work helpful in seeing how the painting developed. Breaking the process down into steps with your commentary is so helpful and well done. And you are providing this for free!! Most enjoyable. My pleasure Laurel, really pleased you enjoyed seeing the painting develop. Thank you for all you share with us! I can’t wait to try this! Hope you enjoy it Marie. 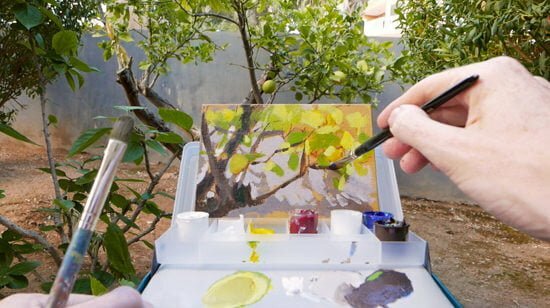 Thank you for the tutorial, I will apply your teachings, in a few weeks, to paint part of a lemon tree I have in my garden in Portugal. Thank you, too, for all the work you put in your lessons in order to teach us how to paint and be better artists which, in my case, is very important because I’m not a professional one. Best wishes for you from beautiful Kenya! Thanks very much Ana, so pleased you enjoyed it, good luck with painting the lemon tree in your garden. Loved the tutorial – excellent as always. My concern with this is that your sketch and painting obscured the object you were painting. A different camera angle perhaps? Pleased you enjoyed the tutorial Bobbi, you can print out the reference image provided to view the subject I’m looking at throughout the lesson. Thanks for sharing your work. Really enjoyed listening to each step you explained. 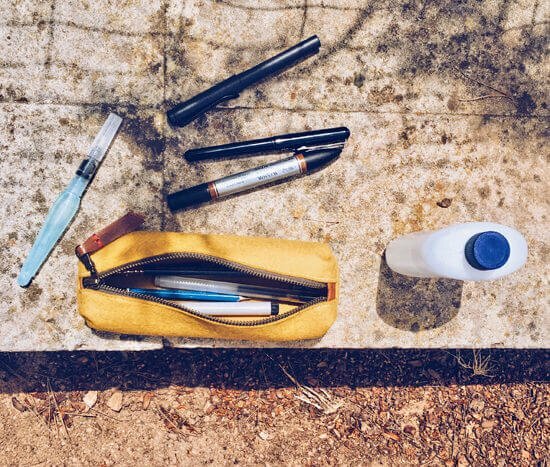 Have you had any trouble going through airport security with your art supplies, especially the paints? I usually fly with only a carry on backpack. I would love to paint on my trips but worry about getting through security. Hi Deb, acrylic paints are fine to fly with, there are some art materials that are not allowed as the flash point is too low for hand luggage. A ‘flash point’ is a temperature at which a product will flame (a higher flashpoint is safer). Any product or material with a flash point below 61° Celsius (140° Fahrenheit) is classified as dangerous goods and these products cannot be included in either checked or hand baggage during airline travel. Here are a lst of Material Safety Data Sheets from Winsor & Newton you can print out to include with any materials. Thank you so much for this and all of the other lessons you post. I’m a beginning painter and have taken a couple of classes locally, but I am learning a lot from you as well. Really a great help! So pleased you’ve been finding them helpful Steve. 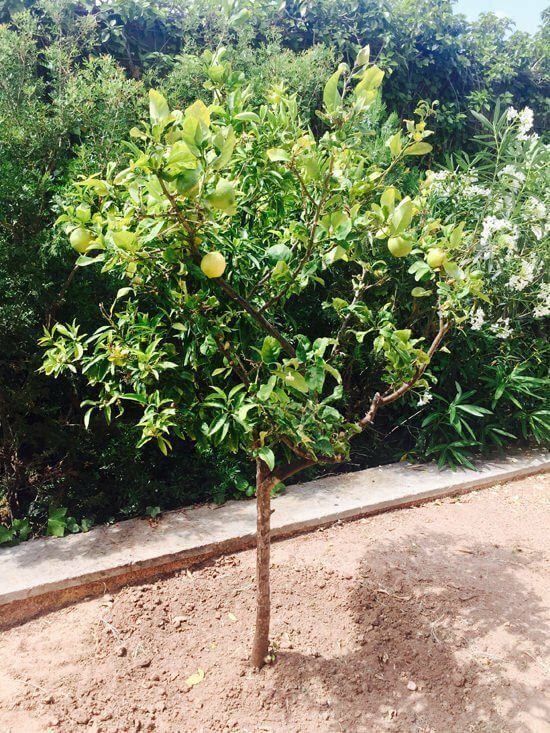 I live in Mallorca and have a finca full of lemon treets, figs, oranges, bourganvilla etc. etc.What I find intersting is that you can distill all the images that one sees into one lemon branch. I know I always tend to make the mistake of complicating my plein air paintings! I really enjoy all the information in your articles and following them up on internet. I have just read about Ralph Heimans and that he uses old master glazing techniques. 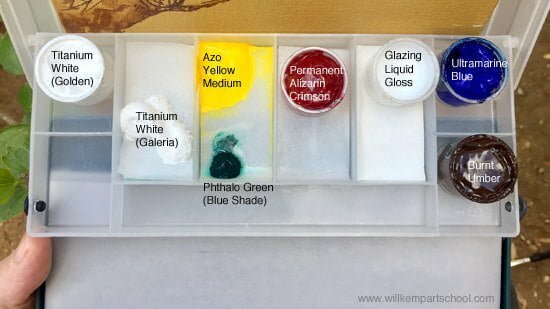 I have looked at your portait glazing article but would love some information about oil glazing for still lifes and landscapes. Would this be posible? Hi Joanna, nice to hear from you, and pleased you enjoyed the tutorial. 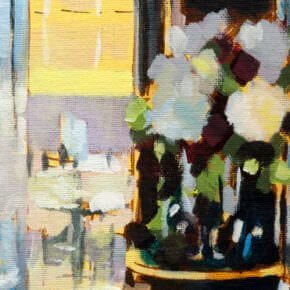 For glazing of still lifes, it’s often a case of assessing the underlying colour of the object and then adding a glow to that by painting a thin glaze over the surface. I have just finished your still life of the cup and saucer and now realize how much I need to practise all your advise. I shall now tackle the lemon branch! My pleasure Joanna, glad you enjoyed the cup and saucer lesson. Good luck with the lemon branch. Great demo, Will! Lovely fresh colours! I particularly was interested in how you handled doing the foliage, which is something I really struggle with: when the tree is too close to do leaf masses, but too far just to do a study of one or two leaves… you just sort of indicated the presence of the leaves without going into unnecessary detail. I find that balance quite hard to achieve and it makes drawing/painting trees quite intimidating! So, really happy to see this tutorial, and pls do some more on this subject! So glad you enjoyed it Peter, yes, it’s a balance between the shapes and the illusion of the leaves. Often, if you have one area with more details the viewer’s mind creates the rest of the scene. 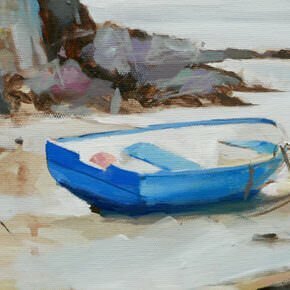 I’m about to embark on my first PleinAir festival in Bermuda, and a friend mentioned your name and website as having great tutorials and information. Here I am and what I learned in the first 30 seconds was amazing. Just isolating that one branch put the whole ‘painting the great outdoors’ into a manageable idea. Thanks for that. It sounds so simple and yet I couldn’t see the trees for the forest, so to speak. I’m looking forward to spending some time with your lessons. That’s great to hear Judy, so pleased you’ve been finding the lessons helpful. Have a fantastic time in Bermuda! This is so pretty. I can’t wait to start painting it.. Thanks for sharing your talent with us! Thanks Will. Excellent painting, great practice. I thank you also because I finally manage green color with all your videos, especially this one. For some reason my painting turned out a little bit shinny, not that bad, but I would love to have the finish you have. Am I using too much water.? I use Liquitex heavy body. Hi Rebeca, really pleased they have been helping you to mix and match naturalistic greens in your paintings. 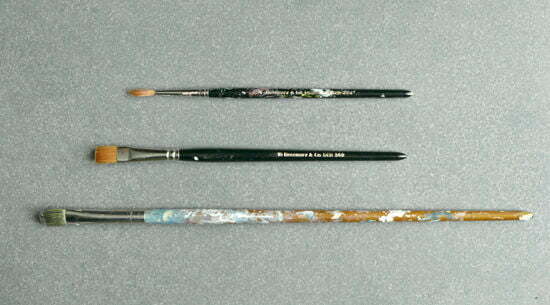 Different manufacturers have different levels on sheens in their paintings. More water will make the surface less shiny. What I do is paint the subject and then apply an isolation coat (which is glossy) to the whole painting to even the sheen and then judge how matte or gloss I’d like the finished aesthetic to be and then varnish accordingly. Thank you so much for sharing all your precious secrets with us! These videos are so incredibly helpful. I started painting just 2 weeks ago and have done almost all of your free tutorials. On to the paying ones soon! I wish you had a gallery on this website of your students attempts! I’d love to send some in :D Thanks again! How do you do to clean your acrylic brushes outside, it dries very quickly. Hi Erick, using a small pot of water to rinse and clean.